If you wonder how to show cash on deivery fee with associated tax value on the invoice - check this guide. Tutorial is applicable for "cash on delivery with fee" module from my offer. The main problem in such case is fact that all cash on delivery modules do not have feature to show cod fee and cod fee tax on invoice. Just because prestashop is not ready to show custom taxes on invoices. 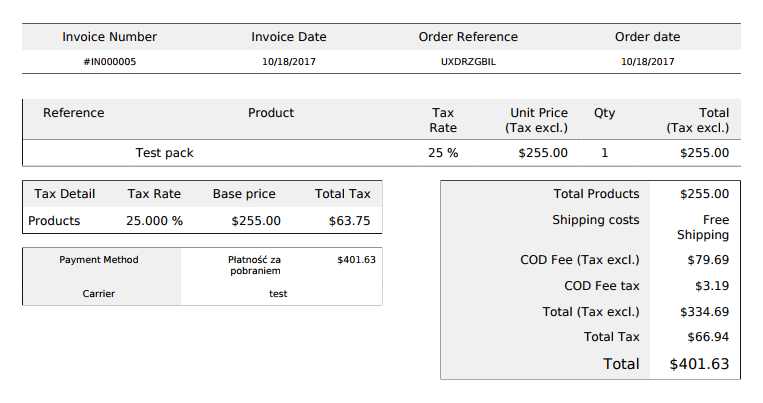 As you can see on the screenshot above, COD Fee and COD Fee tax are included to the summary. This is how it should work. But by default it is not possible to achieve this in PrestaShop. This guide shows how to create such feature and show these additonal fees if selected payment method will be "cash on delivery with fee". And that's all! Your invoices will show additonal fee and tax inside price summary properly.